Now that the weather is great, spending time outdoors relaxing makes you notice the little things: the blooming shrubs and trees, the chirping birds … and the patio furniture. Yikes! For some homeowners, their patio furniture has spent a long winter in the cold and damp and looks terrible. 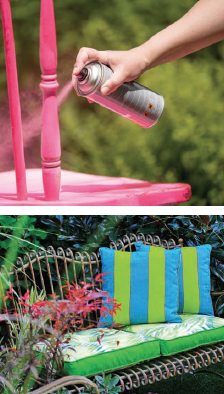 Fear not, for while outdoor furniture is easy to neglect, it is also easy to clean and repair. Once you give the pieces a thorough wash with soap and water (a degreaser like Dawn or Simple Green is easy on the material, but gets the gunk off), let them air dry and give them a good look the next day. If your furniture needs more cleaning, try these tips. For plastic furniture, Pine Sol, an old toothbrush, a bucket of warm water and an old t-shirt to buff it dry work well. Use the toothbrush to get the cleaner in crevices and rinse that area well. If you rub carefully in all the places where the arms and legs meet the seat, you should be able to remove the old build-up with a few tries. If your furniture is still dull and faded, try adding bleach, hydrogen peroxide or an Oxiclean product to the warm soapy water (be sure to wear gloves). Another option is to spray paint it with the new paints made specifically for plastic, such as Krylon Fusion for Plastic. Cast aluminum and wrought-iron pieces benefit from waxing just like cars do. After you’ve washed and dried each piece, give them a generous coat of car wax, let dry and as you rub off the wax with an old t-shirt or towel, the color comes back with a shine. If they are chipping and rusting in spots, wash and dry them, then wipe down with mineral spirits and scrub any rust spots with steel wool. Put them in the yard on top of newspapers and use spray paint specifically designed for metal to give them a fresh coat of paint. You might change colors for a new look on your deck or patio. If so, they will need several coats. Cover aluminum or metal pieces with a thin coat of spray paint and let each piece dry 24 hours between coats for best results. A few thin coats look better than one thick coat. Wood furniture is easy to maintain as long as it hasn’t gotten any mildew spots. A simple wash with warm water mixed with Dawn soap or Simple Green and a light scrub with a natural-bristle brush should remove mildew spots that frequent wood furniture. If elbow grease doesn’t remove the grime, you will want to purchase a product specifically for removing mildew from wooden patio furniture. Once your wooden pieces are clean, you can go several ways. Wood is beautiful left natural, or you can rub in lemon or teak oil to make it shine. If it is painted and the paint is in good shape, you can seal it with wax or polyurethane to bring back its sheen. If the paint is chipping, a light sanding and some fresh paint will bring it back to its glory days. Wicker furniture is either old, traditional painted wood, or the new resin-coated pieces. For traditional wicker pieces, a good scrub with warm water and a mild soap will get off the spider webs and dirt that build up in the small weave. Rinse the piece off with the hose, giving it a good blast to get in the cracks. Let it air dry and it is ready to use. If the paint flakes off, then it will need a light sanding with fine sandpaper and a coat or two of spray paint to restore the finish. The new resin pieces should come clean with just a scrub of soapy water and a good rinse. Getting wicker wet makes it pliable again, so now is the time to reweave any broken or loose pieces back into the furniture. Once they dry, they should stay in place. Pillows and outdoor rugs look fresh again with a scrub of cool water and soap. (Warm water isn’t good for most of these fabrics.) Look inside the pillows or under the rug to see if the manufacture provides cleaning instructions. It is best to follow those. If there isn’t any advice, remember that less is more. Remove pillow inserts and let them air dry on a sunny day. Wash the covers in the machine on delicate and let them air dry. While slightly damp, replace them on the pillows and place in a sunny spot to finish drying. You want them to easily stretch back on the pillow forms. If there are mildew spots, test an inconspicuous spot with a mixture of warm water, soap and a few drops of bleach. If the color doesn’t run, you should be safe to use this solution to spot treat the mildew. Once you’ve dabbed it on the spots, let it sit a few minutes then wash them in the machine on cold. Air dry and replace. Rugs can be scrubbed with warm water (less than 100 degrees) and a little Simple Green. Again, check the label for cleaning instructions and if there aren’t any, test a corner to make sure it is colorfast. Scrub and hose off with cool water. Hang so the air circulates underneath, and it will dry well. With a few simple chores, the whole deck, porch or patio feels new. When you put it all back together, you might rearrange the seating layout for a fresh look. Add some summer plants to your pots, and you are ready for evenings relaxing with a book or inviting friends over to throw something on the grill—those memorable nights of summer fun.